Cuba’s worm farming revolution is not as well known as her political one. 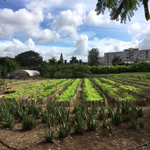 Often heralded as a nation that has already survived a peak oil crisis, by necessity Cuba has come to be known as a global leader in the organic movement. Worm farming played a key role in that remarkable story. Whilst undertaking my Winston Churchill Memorial Trust Travel Fellowship in 2016, Cuba was naturally the number one destination to explore, representing the possibilities and ability of a nation to thrive in the face of adversity with a little help from the humble but mighty earthworm.